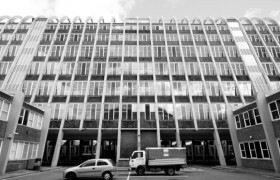 At the end of June 2013, the building known affectionately by local residents as the ‘Toastrack’ was finally vacated by Manchester Metropolitan University (MMU). Part of a major restructuring programme which has seen the university consolidate its operations in two locations within the city, the future of the old Domestic and Trades College, Grade II listed by English Heritage in 1998, is uncertain. 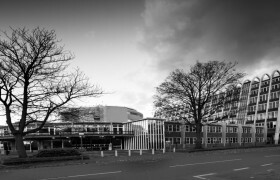 Constructed between 1958 and 1960, the college was designed by Manchester’s City Architect’s Department, then under the stewardship of Leonard Cecil Howitt, and reflected the growing national demand for further education in the post-war era: the 1944 Education Act had made available free secondary education for all children upon reaching the age of eleven whilst also raising the school leaving age to fifteen. The origins of the Domestic and Trades College lay in the Central Girls and Women’s Institute, established in 1901, and was, at that time, described by one Guardian journalist as being almost entirely attended by women ‘doing what was then called recreational studies’. Later, with the outbreak of the Second World War and the advent of clothes rationing, classes which promoted an ethos of ‘make-do-and-mend’ proved so popular that Manchester’s Education Committee would provide additional accommodation in various locations across the city. In 1950, the purchase of land adjacent to Birchfields Park made possible the consolidation of these variously dispersed departments in one location. Thus, the Domestic and Trades College came into being. Erected by the general contractor J.Gerrard and Sons, with L.G Mouchel & Partners acting as structural consultants, the building is comprised of three inter-connected components with a standalone single-storey block, originally the tailoring department, deliberately isolated from the main college due to the noise and vibration caused by the sewing machines. 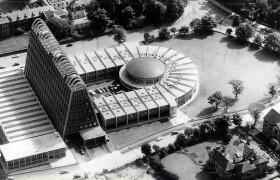 A two-storey concrete structure, horse-shoe shaped in plan, is arranged around a three-storey circular drum and once housed staff and administrative rooms along with a catering department, student common rooms and a restaurant open for use by the general public. The restaurant, given prominence on the first floor, overlooked generous landscaping intended to mitigate traffic noise. Somewhat optimistically, given the local climate, an external terrace afforded the possibility of dining al fresco. 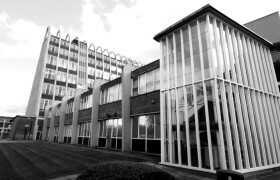 The drum, a later addition by the architects Mills Beaumont Leavey Channon (MBLC), was completed in 1996 with the college having been absorbed by MMU four years previous. Providing additional study space and library accommodation, MBLC sought to emphasise the circular nature of the form by removing intrusive central support columns. Lattice beams, arranged like the spokes of a bicycle wheel, transfer the weight of the aluminium standing seam roof to a series of steel columns offset nominally from the external wall; a mixture of aluminium framed glazing and terracotta coloured render on insulated board. Elevated above ground level and supported by a single central column, the drum occupies the footprint of the original first floor assembly hall. This earlier structure, topped off with a shallow aluminium dome, attracted the moniker the ‘Poached Egg’; an appropriate adjunct to the eight-storey tower referred to as the ‘Toastrack’. Made up of 23 reinforced concrete arches, and rising to a height of approximately 134 ft., the tapering form of the tower was, according to an unspecified design team member, adopted “as otherwise it would have been impossible to accommodate such a wide diversity of rooms”. With the ground floor left open, other than for access, larger rooms such as lecture theatres, bakeries and laboratories were positioned on the lower levels. Smaller rooms, mostly classrooms, were placed on the upper storeys with a sun terrace at the very top. The reinforced concrete structure is expressed externally whilst infill is mostly provided by aluminium framed glazing and ‘rustic brown red’ tiled panelling below cill level. End gables incorporate vitreous enamel kick panels, typical of many post-war educational buildings, and enabled the introduction of a splash of colour; here, a greyish blue. An aluminium sculptural work, Icon by Hubert Dalwood, was installed in the entrance lobby prior to the college opening. Subsequently removed, its current whereabouts are unknown. Generally, however, the building was devoid of decoration with rendered internal walls given a simple paint finish and this remains so today. Despite numerous name changes, the most recent being Hollings Campus (in honour of Miss Elsie Hollings O.B.E., the college’s first Principle and ‘guiding spirit’), this building is, excluding schools, one of only six erected during Howitt’s tenure as City Architect to survive largely intact. Following the extensive remodelling of Manchester’s Airport Terminal Building in 1974 by Howitt’s successor, Sidney George Besant-Roberts, those surviving buildings are Heaton Park Reservoir Pumping Station (1955); Wythenshawe Fire Station (1957); Blackley Crematorium (1959); Wythenshawe Bowls & Tennis Pavilion (1960); and the Manchester Courts of Justice (1961). Representative of a body of work produced by a department labouring to implement the city’s ambitious post-war rebuilding plans it is hoped that, whilst the Hollings name rightly continues at the new city centre faculty, an alternative use may be found for this delightful building; a truly iconic feature of the Manchester skyline. Matthew Steele is studying at the Manchester Institute for Research and Innovation in Art and Design (MIRIAD) having assisted the Manchester Modernist Society in their year-long creative-residency at the Hollings Campus. For more information follow the Toastrack blog.